The National Council of Cultural Heritage on the island decided to declare Cultural Patrimony of the Nation, a tradition symbol of identity on the island. It is the knowledge of the Masters of Cuban rum, as well as manufacturing spaces in which the transmission process of such knowledge occurs. The youngest Cuban Rum Master of all ages was born in Santo Domingo, three spans away from a sugar mill. His story smells like batey, sweet love and, above all, a legitimate passion for the wonders of the rum tradition. If the souls had any smell, César would like that of his to smell like batey: live dust and sweat-soaked shirts; leather of laborers who do not believe in brave suns or rabid santanicas; guano in the head and bagasse in the nose, spirits as hard as a mule kick. I would not think to ask him about his faith, but the story of his life is practically a "conspiracy".A happy one, let me clarify.He came to the world in September 1976, in the day that Cuba celebrates its mambisa virgin. Another boy in the community of Rodrigoin Santo Domingo, where almost all his fellow citizens worked in the industrial sector.His maternal grandfather was head of machinery of the Carlos Baliño sugar mill-formerly known as “the Ulacia”. César does not remember clearly whether at some point he invited him to accompany him or if he followed him to the mill, but long before knowing the alphabet he was already learning among irons, asking too much, feeling like a man.“The French and the South Americans know about grapes and wines. Cubans know about sugar cane. It is in the DNA of the nation, and those of us who grew up so close to the cane fields and the sugar industry, value, perhaps as others can’t, every phase of production, in which derivatives like rum occupy a position of preference. In this aspect, knowledge is determinant, but if we do not put love onto it, nothing memorable is obtained.So many years living close to a sugar planttaught me how to decode the cultural and social meaning of the guarapo, the cane liquor and the different and indescribable smells that are only found in a batey. There, everything is unique, even people, and that virtually filial bond established by people with the sugar milldevelops not only a certain rhythm of coexistence, but also their own flavors".-Is there anything essentialfor those who dedicate themselves to preserve and optimize the alcohol memory of the island?-If there is no intimacy with the environment surrounding the rum production, then you will not know it fully and you will not love it as it deserves. Someone that does not love Cuban rum will never be able to represent and understand it in its total dimension, which would betray one of the most beautiful traditions in national history.- What if you were born in the city? Or anywhere else away from the cane fields and the whistle of a sugar mill? Do you think you would devote yourself to the same profession?Most likely not, because if you do not live it, you do not feel it. I do not imagine which profession I would be practicing today, but I doubt that it would fill me as much as my work. Every day I thank life for placing me on this path.In 2009, César Augusto Martí Marcelo became the youngest Cuban Rum Master of the country, a condition he has maintained up until today, despite the fact that two other designations have already been made.However, the decision of the top directives of Cuba Ron Corporation S.A. was anything but precipitate: when he received the category he was barely 32 years old, but almost all his student and work years had been spent in the Central Rum Factory "Agustín Rodríguez Mena", in Santo Domingo. "I graduated in 2000, in the specialty of Chemical Engineering, at the Central University of Las Villas, and after graduating I had the good fortune to start working as a technologist of the Central Rum Factory. However, I did not feel like a rookie who probes unknown terrain, because during the five years of the career I did work practices there.«Back then, MSc. Carlos Rafael Soto Castellón, currently the first vice president of Cuba RonS.A., worked as a technologist of the "Agustín Rodríguez Mena" and dedicated his time and expertise, along with many other workers with decades of practical knowledge, to convey some of the keys and essential knowledge in this world ». - What motivates you more as a Master of Cuban Rum: maintaining the tradition or promoting the innovation of the product? -I believe that the people and experiences that I was able to learn from, first as a student and then during the initial stage of my work in the Central Rum Factory, were defining for my professional philosophy. There arose one of the greatest passions of my life, an intense, inexpressible love, so my goal has been none other than fully interweaving myself in the preservation, custody, enrichment and defense of the Cuban rum of the central part of the island as a cultural expression of the region.César talks about the "Agustín Rodríguez Mena" and the Cubay brand and it seems like a dream factory. His spirits rest in oak barrels or bottles to amaze; they are sipped slowly, like someone who brings a miracle to his mouth.-Numerous specialists assert that Cubay has already established roots at the peak of Cuban rums, and in such a competitive industry, that affirmation must be supported by more than proven evidence.-The brand was born in 1993with just two lines: the Añejo and the Carta Blanca, but starting in 2000, it began to take off, so we can speak of aninflection point in the quality and variety of its proposals. 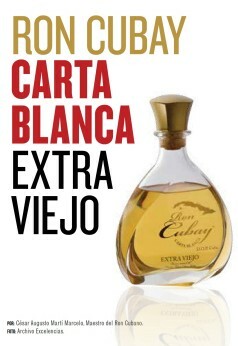 At that time, we already had a product in traditional range of extra quality, and then I was commissioned a new design for the El Corte Inglés store chain -the Cubay Carta Dorada- that joined the CubayAñejoSuave. However, during the last five years we were able to witness how more and more solid steps were taken towards full maturity, which today constitutes an irrefutable reality. "Currently, Cubay has the Golden Letter, which is a very interesting product within the brand as it marks the transition from white to aged rums. The emblematic class of the latter has two products: the CubayAñejo Suave and the CubayAñejo, belonging to the same typology, but with completely different aromas, flavors and textures, and in the traditional range we have the Reserva Especial 10 Years, the signature drink of the company".-However, it was obvious that the potential of the brand reached much more.-In the last three years we have incorporated a luxury range with two new rums: the Cubay Carta Blanca Extra Viejo, which constitutes the maximum expression of the Cuban white rums, and the Cubay Extra Añejo 1870. The latter contains the sincere tribute that the "Agustín Rodríguez Mena" rum factory and Cubay intended to make to the founding date of the first rumfactory of the central zone, Alambique El Infierno, in Sagua la Grande, considered at the time as the most important in all America.- It seems the national history has given body to the best of the Cuban rum produced in the center of the country.Undoubtedly. Last May, during the celebration of the FitCuba2018 International Tourism Fair, we launched the Cubay Extra AñejoRemedios 500, which is the undisputed top of the brand. We speak of a special reserve and a very limited production - barely 1000 bottles a year - as it is an exclusive rum with which the most specialized tasters are practically maddened by the quality and nuances it contains.- How is the taste of a half millennium old village conceived in a single drink?-This industry is an art, and in the same way that a sculptor carves the wood to shape it according to a concept or feeling, or when the painter leaves the soul on the canvas, we create the mixtures to reflect, through this drink, the cheerful, multicolored, hospitable and cultured character of the Remedians. The Remedios 500 is a memory rum, because there are traces in the project of the so-called "exquisite technology"developed decades ago in the center of the country. Equally happens with the "1870", since it is the result of rums and spirits that have been aged by several generations of masters of the Central Rum Factory, which makes ita historical reserve of the region.- And what would be then the liquid taste of Cuban?-This island is too splendid to bottle it as a unique drink. Therefore, we continue working, moving, daring, but all through respect of the mother tradition of our rums. "Each new product contains the articulated work of hundreds of masters and workers who, for more than 150 years, have given flavor to this nation from their very heart".